Who doesn’t want to go down the rabbit hole for some fun-filled adventure and mystery? Luckily Alice’s Tea Cup Madness promises just that. 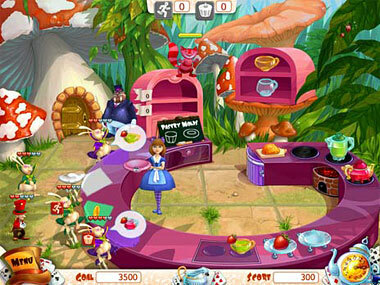 This Time Management game sweeps you off your feet and into Alice’s imaginary world. Poor Alice… chasing the white rabbit got her falling down the rabbit’s hole and now, if she wants to go back to her own world, she must cross the field of flowers, which costs quite a fair bit, but don’t despair! In order to earn money, Alice and the rabbit decide to restore the old Tea House and start selling tea and pastries to magical creatures. In this extremely addictive Time Management game your customers are the White Rabbit, Flamingos, Mad Hatter, Girl Flower, Queen of Hearts, Cheshire Cat, Card Guard and Lazy Caterpillar. Sounds a bit crazy? Well, fear not. Luckily for you, you have the lovely Walrus as your security guard to keep the crowd in order! Working in the Tea House your job is to seat customers as fast as possible while keeping an eye out for matching seat colors. If you manage to match the colors you get a bonus, and the more consecutive matches, the larger the bonus. Once seated you need to take their orders as fast as you can and serve them lemonade in different cups, teas with a slice of lemon on the side and yummy pastries. Make sure you’re quick about it though as unhappy customers will leave without eating or drinking and we don’t want that, right? 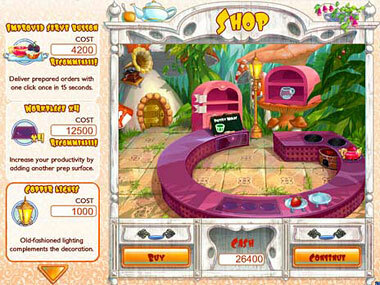 The aim of the game is to make as much money as possible while serving customers. You also get a chance to top up your earnings with a few mini-games that have you catching as many candies as possible while avoiding falling dishes. And… don’t forget to spend some of your hard-earned cash on upgrades! Improving your Tea House with a “service button” and an extra worktop means faster service for your customers. Re-tiling your floor and refurbishing the service counter will improve your décor, and why not buy a gramophone so your customers can listen to some relaxed tunes while they eat? Or at least don’t flip out if they have to wait too long to be seated! 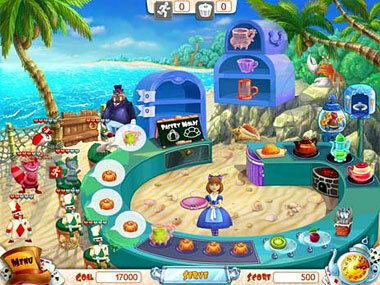 Alice’s Tea Cup Madness features 50 levels of game playing, including 15 mini-game levels while taking you through five different locations: Mushroom Woods, Queen’s Palace, Sea Beach, Rabbit’s House and Flower Fields. While the concept is the same in each location and slightly repetitive, the design and settings are unique and add a distinct flavor to the game, which is truly enjoyable. And, although the mini-games are slightly monotonous and more a distraction to the main game than a “pick-me-up”, they serve their purpose by allowing users to earn more money along the way. 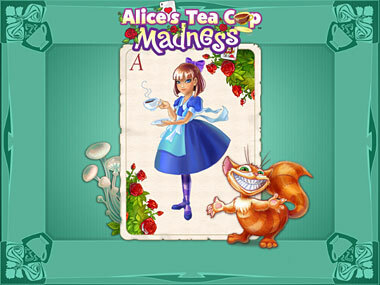 So, while there may be more challenging time management games out there, Alice’s Tea Cup Madness is super fun and anybody who loves the story of Alice in Wonderland will definitely enjoy it! 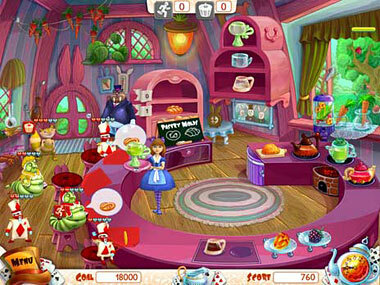 Download and play Alice’s Tea Cup Madness now for FREE! i think this will be a good game. I like games beacuse they just make me have a very enjoyable working day. When am stuck a pick an interesting game to clear my mind. Please, does anybody knows where can I download the full version? Or it’s only for money? Ruby, all Free Ride games are the full versions. You can download them for free and play them for as long as you like, there’s no time limit. Enjoy!